Back in the Mad Men days, just about everyone was either a General Motors man or a Ford man. Cadillac or Lincoln. Buick or Mercury. Nowadays it may be as much about Toyota vs Honda, but the Detroit rivalry is far from dead. Arguably more than anywhere else, it's played out in Australia, where it's all about GM's Holden versus Ford...in the showrooms, on the streets and, perhaps most of all, on the race track. While up in this hemisphere the Detroit automakers play out their rivalries in stock cars on super-speedways, Down Under it's all about the V8 Supercars series. And this past weekend's race at Surfer's Paradise was one for the ages. This year's Gold Coast 600 drew a star-studded lineup of international racing superstars from around the world: names like Castroneves, Bourdais, Franchitti, Dixon, Salo and Villeneuve. But it was the seasoned series veterans racing against the fresh-faced newcomers who made for some of the most nail-biting action you're ever likely to see. It was all about defending champ Jamie Whincup in the Team Vodafone Holden Commodore against young Shane Van Gisbergen in the Stone Brothers/SP Tools Ford Falcon. Watch it all unfold down to the line in the video after the jump. Thanks to all for the tips! Talk about all balls out, these guys looks like they should just fly off the road at any second. WOW They left nothing on the race track that day. If your not rubbing your not racing! Great win for Holden some of the best driving I have seen in a long time. 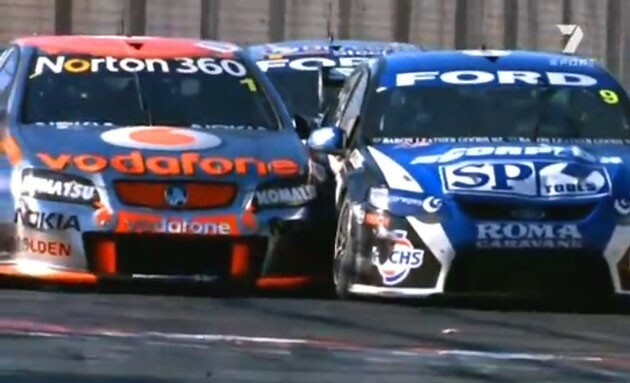 This is why I love the V8 supercars. The last lap was nuts, Whincup had his hands full, yet he didn't fold from the rookie's pressure. Awesome stuff.